HRH The Duke of York, KG, travelled to Bristol today [10 February] to meet with entrepreneurs in the city’s innovative new Engine Shed and to visit the Bristol Robotics Laboratory (BRL) to gain an insight into the latest advances in robotics research. The Duke, who previously visited the University of Bristol’s SETsquared Centre in 2011, made his latest visit to see the pioneering centre in its new home by Bristol Temple Meads. At a working lunch HRH learnt about the challenges facing today’s technology entrepreneurs from the SETsquared Centre, a world leader in developing high-tech, high growth businesses. He also met with members of the new WebStart Bristol internet accelerator, another Engine Shed resident. Representatives of the West of England Local Enterprise Partnership (LEP), the University of Bath School of Management & Bath SETsquared Centre, and the inward investment service, ‘Invest in Bristol and Bath’, also attended the royal visit. 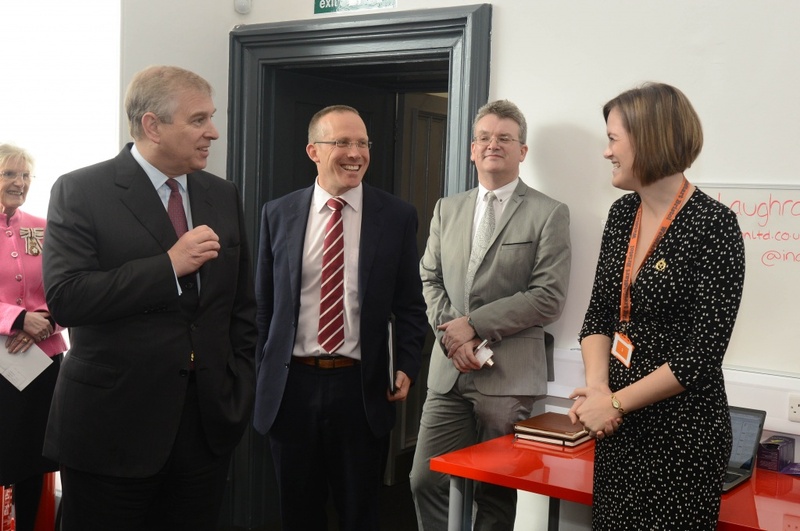 Nick Sturge, Director of Engine Shed and of the Bristol SETsquared Centre, said: “We are honoured that The Duke of York was able to visit us again and see our exciting new home. It is invaluable that Bristol and Bath are acknowledged for the robustness and vibrancy of the tech startup scene. The Engine Shed, housed in Brunel’s original train station, is an enterprise hub for the city and was designed to drive investment forward, create jobs, and encourage a new generation of high-growth businesses. His Royal Highness commented: “I am very impressed with the connectivity between the universities and the business world. The LEP also announced today that 12 member businesses from the Bath and Bristol SETsquared Centres have been successful in obtaining grants totalling £2.08 million from the West of England Growth Fund. This includes £1 million award to BluWireless Technology, the fund’s largest ever grant. Blu Wireless, a Bristol SETsquared member, is developing next generation wireless technology and last year raised £2.1 million from local and national investors. Since formally opening in December 2013, Engine Shed, has won UKBI 2013 Business Incubator Design Award, is already full and seeing an increasing demand for space. Bristol Robotics Laboratory (BRL) is the leading and largest academic centre for multi-disciplinary robotics research in the UK. It is a collaborative partnership between the University of Bristol and the University of the West of England (UWE, Bristol), and home to a vibrant community of over 100 academics and industry practitioners, which lead current thinking in service robotics, intelligent autonomous systems and bio-engineering. The Duke met scientists and engineers from the many different disciplines working in BRL including: materials scientists, software engineers, microbiologists, psychologists, aero engineers, control systems engineers, surgeons and clinicians. He saw many disciplines being brought together to tackle important UK issues such as independent living in an aging population which the Mobiserv project is addressing, remote tele-robotic systems for remote medical inspection and how artificial muscles can be controlled – ideas inspired by how the mammalian brain functions. He was also shown groundbreaking research into energy autonomy for robots using waste, which has recently been awarded prestigious Gates Foundation Funding, where researchers have charged a mobile phone using urine as the power source to generate electricity. His Royal Highness also met innovative start-up businesses based in the BRL incubation facilities, with product developments in gaming, plastic reflective displays, 3D printing and robot kits for STEM education.